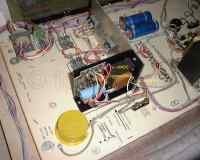 I have finally compiled the complete set of schematics and troubleshooting guide for the 1st generation Allied Leisure Industries (Florida) pinball games that used a number of separate logic boards. Lets call that System 1 - 1975. System one did not have a CPU, rather it is a collection of 10 or so circuit boards that makes up the logic for the games. All used the same playfield, cabinet artwork, wiring and circuit boards with the only differences being the backglass and if they had two or four players. We can not service any of these three game boards in our shop at this time as we have no test fixture for these multi-board ALI pinballs. The single MPU board I'm calling System 2 (2A) used a single logic board that orinaly had keep-alive resistors for the lamps, PCB50210125 to PCB50210125E (F?, G?) - note this board is NOT RECOMMENDED for use due to the lack of input protection circuitry for custom 6530s (more on upgrading this board later)! The photo shows System 2B MPUs with the resistors not installed by the factory. (not all Rev. E had those pull-ups installed). System 2A can be identified by the card edge connector on the upper left in the first photo below. This card edge connection was removed for the later System 2B, C, and D and a number of extra ICs were added to help protect the 6530s with System 2C & 2D. If you have a System 2B or 2C MPU I recommend adding the 22 input protection diodes, as described below, for all switch lines to help protect the 6530s from electrical shock. Jan, 2017 - in the near future I will make a photo essay of how to proceed to upgrade the System 2A/B/C board with protection diodes. System 2C PCB50210125H changed the board design slightly, it had the same basic single board but added input protection for 6530s and had deleted the pull-up resistors and unused driver transistors, upper right card edge connector, etc.. If you have a choice, repair or restore this version or later. Note there is no card edge connection on the upper left of the first photo (on the left) below. As near as I can tell ALI released four versions of their motherboard (6504 based CPU) PCB50210125 - the PCB50210125E (1st with and 2nd without upper right card edge connector - but no switch input protection) and later PCB50210125H - the first version of "H" had resistors, the second version had 22 diodes to replace R77-R84, R143-R154, R161, & R162. I highly recommend replacing the resistors for diodes, banded end facing the card edge connector. Use 1N4002 (100PIV) or higher rated diodes. ALI manufactured a number of pinball games all based on one MPU (Central Computer) board as shown below (MPU System 2 & 3). The MPU was powered by a single +5VDC power supply usually located on the bottom of the cabinet. (see below), and you want to make sure it does produce 5VDC (+/- 0.25VDC) at the MPU. You can measure the 5VDC at the filter capacitor mounted on the lower left side of the MPU board (just below the three plastic plugs Green/White/Red on the far lower right of the MPU). The pinball games made using this MPU (the features - lights, switches and coils - were re-arranged by ALI to change the rules for each game) include: DISCO 79 (c/t), EROS ONE (c/t), HEARTS & SPADES (c/t), HOE DOWN (u/r), ROY CLARK/THE ENTERTAINER (c/t), STAR SHOOTER (c/t), TAKE FIVE (c/t), THUNDERBOLT (u/r), and GETAWAY (u/r). u/r = standard upright pinball. c/t = cocktail style pinball. Here (below) is the 5VDC power supply that needs to be checked for proper voltage and that the capacitors are in good condition. Check for good 5VDC across the main logic board filter capacitor (picture). Note that linear power supplier like this one can appear to have good 5VDC output when measured with a voltmeter, however you MUST also check if there is any AC ripple by setting your voltmeter to AC and then put the leads across the output terminals - the reading should be 0.00VAC. If it is more than about 0.1VAC then the power supply needs servicing or replacement with a modern switching supply or rebuilt linear (if you want to be authentic). Note too that if you rebuild a linear power supply that you verify the output is 5VDC BEFORE reconnecting the power supply to the wiring harness! I now recommend (2010) that you either rebuild or replace the old Linear power supply with a modern switching 5VDC power supply. Ones that are used for Video Games are quite satisfactory and easy to install. Simply hook them up according to the yellow labels just below. I do not have a sample picture I'm afraid, so you will have to figure this out yourself - just be CERTAIN that you are connecting the +5VDC of the power supply to the wires that went to the +5VDC of the original supply, and the same with the Common/Gnd and AC Power lines! If you are NOT certain please get a professional to replace the supply - you do not want to blow up your logic board by mistake! ($350US kissed good-bye). The photo below shows that the ground connection is pink, and the +5VDC connection is white-blue. So do NOT assume the wires meet the usual convention of ground being black and +5VDC being red...check the lable on the original power supply to be sure. 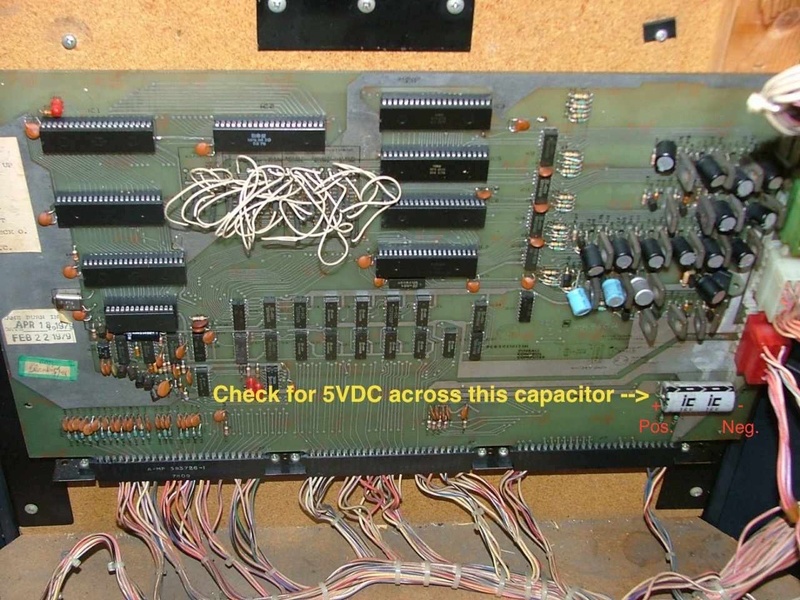 You can doublecheck by doing a continuity test to the large capacitor on the lower right corner of the main logic board, it is across the 5VDC power lines and you can check that the negative on it goes to the negative (ground/common) on the supply and that the positive goes to the +5VDC terminal. Another problem with these games is the bottom (of three on the side) power connection to the MPU board - usually red. The issue is ALI only used one or at most two pins for the two Grounds and +5VDC supply to the board and if those start to fail then you will have a board that isn't working properly and this may contribute to blown solenoid driver transistors (I need to verify that). The fix is pretty easy - you just jumper the three sets of bottom pins as the photo shows below. I recommend this for ALL ALI MPU System 2. We now provide a kit of the pins and jumper wires. The pins are AMP pins. If the middle row has two wires in place already then don't bother with doing the change to that row. The bottom and next up are the 5VDC common and power and are the critical ones to be upgraded. We also will shortly have new board connector blocks to replace corroded or otherwise damaged female socket pins as you have to replace the entire base because the individual pins were not designed to be replaced. Another common problem with these games are the poor quality fuse holders - I recommend that you change any that are not a hard bakelite or plastic body with a new holder. We sell mulitfuse holders if you can't find them locally. Note the two pair of old fuse holders just to the left of the +5VDC Supply. You can use an ALI 4 player System 2 MPU board in a two player cocktail - the cabinet has a jumper to tell the board to be in either two or four player mode. 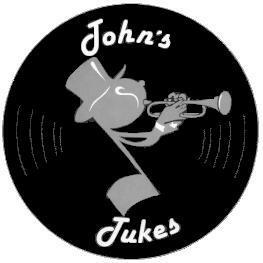 Jan, 2017 NEWS - we are designing a replacement PCB for the 3 6530s - stay tuned! In both revisions of the MPU the three 6530's are the same three part numbers, however these R6530s (-09(IC5) , -10(IC6), and -11(IC3)) have to be in their correct sockets or the board can not work!. I am again working on replacements for these - have the design worked out, now am going to run off the circuit board to test. Should have results by the summer...note that the Bally Home Model Pinball games did NOT use the 6530 and this will NOT work for them. That will have to be a separate project - unlikely that I will attempt it as the payback is even worse than the time invested in the replacement 6530 RAM/ROM/I-O/Timer project. Indivdual replacements for these three ICs (6530s) should be available by April, 2017 - design is working, and testing is proceding. Note that the order of the IC numbers is NOT the same order as the socket numbers. A 6520 is identical to 6820 or 6821 and can be replaced with either, although the 6821 is the more stable upgrade from the 6820. LED #3 & #4 - Should light during RESET, then go off/dim and only blink periodically. 1) If there is a stuck TILT switch (pendulum or ball roll cage) the game will not start. Symptoms include displays working in Attract mode, but after starting the game when the ball rolls over the ball index switch the game immediately goes into TILT (lits up). So make sure the pendulum tilt is in the middle of the metal ring, and that the ball roll Tilt is all the way to the front of the cage! 2) The game will ignore ALL switches if a stuck switch is detected during normal game play. 3) The game will not start if the "Ball In Play' switch (ball shooter trough) does not make contact at the start of each ball in play. 1) Remove the ball from the game(shooter trough) otherwise the self test can't always work correctly. 2) The game will not go on from Stuck Switch Test if a switch is stuck closed! 1) Reseat MPU board in the three bottom sockets with power off - lift up and push back down a couple of times to clean the wipers. Game starts but no scoring: make sure runway switch closes otherwise computer ignores all switches. Also if the Outhole Switch doesn't register then the game will start, but not kick the ball into play. Game ignores some or all switches: If all switches ignored, then look for a jammed closed switch behind a rubber ring or standup target. If you can't spot one, then - using a volt meter with the negative lead tied to common/ground - check if one side of each switch is reading close to 5VDC. If so, then when you trip these switches does the 5VDC on one wire at the switch then go to 0VDC (the other wire is ground)? If not then you have a problem with the switch common (ground) line. If you live outside of Canada you MUST send it to us by Postal Service ONLY! Express Post is inexpensive and has confirmation of delivery and insurance is available. Pretty quick too! Please include a cover letter outlining both the problem and what you would like us to do & your email address, phone number, etc. Earlier ALI pins included odd-balls like SPOOKSVILLE - called a Shakerball. I have parts, schematics, etc for this game, and here is a service bulletin for that game. Yes, you can intermix them - just make sure the correct part number is in the IC socket. > 2) If I only hook +5V to the board outside of the game and assuming everything on the board works, should it boot or does it need to be connected to something else in the cabinet to actually boot? (I'd be looking for LED1 to light, then go out after about 2 seconds) If I make/use a 5V test fixture (of sorts), what amperage power supply would be acceptable for a test like this? Yes, the board will boot with just good 5VDC, and the LEDs should co-operate. > 3) AC Ripple test: I just want to make sure I'm doing/checking this right. I hook + on my DMM to +5VDC on the power supply itself and - on the DMM to ground/common on the power supply itself. I set the DMM to VDC and confirm +5VDC. I then switch to VAC and look for no fluctuation. Should I also do this on C19 on the board too or is just testing at the power supply sufficient? Testing at the power supply should be sufficient, if you are using a switching supply then it is very unlikely there would be any ripple at all. > 4) Is there a good way to test the 6520s? I have a Williams Flash which (as far as I know) I should be able to swap into the driver board to test to see if they work. Or is there a better/different way (ie testing pins for shorts or something like that? the 6520s can be replaced with 6820/6821s, they function identically. > 5) Assuming the reset circuit on all 3 boards is bad, what section of the board should I be looking at to test (I love how Atari outlines this stuff, it makes it super easy to troubleshoot)? Sorry, I know this is sort of a vague question. Check if the Reset signal is getting to the CPU - Reset goes Low briefly (1/2 second perhaps) on PowerUp and then should go High. Low is defined as under 1VDC and High is over 2.5VDC. If so, then the CPU is the next suspect. Of course you need a good Clock signal too.